Boxing and the variations of this ancient sport are some of the most powerful and most effective martial arts. 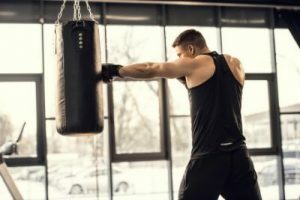 The combination of footwork, punches, and movements don’t only represent an efficient self-defense sport, but also make a great workout routine for anyone that is searching for intense exercises. As any type of boxing is not simple in any way, teaching it is the job for the masters. In order to help you reach all of your goals and improve your health, Dubai PT is here to help you find the best personal trainers of Thai boxing Dubai, fitness, football, karate, Zumba… The list goes on as the number or our professional and licensed personal trainers increases by each day. Boxing has been there for more than a few centuries. The earliest depictions of boxing date from the 3rd millennium BCE. Therefore it is no wonder that this great martial art became the most celebrated and practiced. One of the most popular boxing disciplines is Muay Thai or Thai boxing, which became widely popular around the World in the 20th century. And has also made its way to the UAE. Therefore more and more people are searching for professional personal trainers of Thai boxing Dubai. A great and intense exercise routine. Fun and a highly effective way of losing weight. Boxing improves your stamina and coordination. It is a great way to relieve everyday stress. Effective martial art and an amazing combat sport. Training Thai boxing Dubai will teach you self-discipline and how to remain calm. Boxing is fun and offers many different techniques for you to learn and master. Martial sports are great for meeting new friends. Whether you want to tone your body or drop a few sizes, Thai boxing will make an excellent full-body workout. This combat sport features various striking techniques and includes intense workouts. Therefore it will allow you to build muscles and gain strength. Boxing will make you activate each part of your body. As you will move your legs, punch, bend, duck and move your hips, boxing will be a great full-body workout if you enjoy high-intensity workouts. 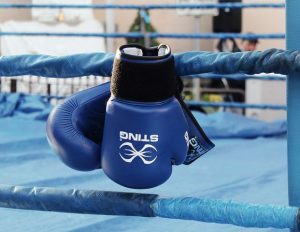 Therefore, the best fitness trainers in Dubai usually decide to include boxing in their clients’ exercise sessions. 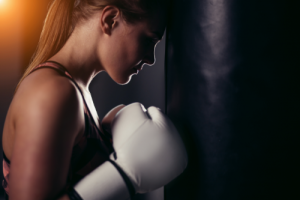 Even though boxing is a martial art and a great self-defense method, it doesn’t always have to be a training routine that prepares you for combat with an opponent. This means that there are many boxing classes Dubai for ladies where all the exercises are modified. Therefore, it is possible to apply for kickboxing or Muay Thai training Dubai, to lose weight and tone your body in a fun and effective way. Depending on a type of boxing you practice, you can lose from 200 up to 800 calories per hour. Whether you box in a ring, punch a bag or practice modified exercises, boxing will make you move your entire body. As boxing combines some of the best cardio exercises, this routine will get you in shape faster than any other! High intense exercises of kickboxing or Thai boxing Dubai will improve your muscle endurance and overall fitness. The increased stamina will improve your other exercising routines and everyday life as well. 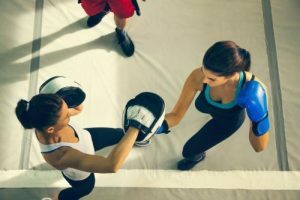 Therefore, even if you plan on starting with a different routine like applying for Zumba classes in Dubai, you should consider adding boxing to your cardio sessions. Boxing is a challenging sport. It requires focus and dedication. With boxing training in Dubai, you will greatly improve your eye-hand coordination by time. During sparring or punching a bag, your brain will learn how to precisely plan your every move and coordinate multiple movements at the same time. Had a bad day? Sweat it out! The fast pace of everyday modern life can leave feeling overwhelmed. Punching a bag or having an intensive workout can help you relax and relieve the stress. Not only that your muscles will be relieved from the tension. During physical activity, your brain produces endorphins, the chemical that is in charge of triggering positive feelings in your body. Therefore boxing can even help you be happier and have a healthier lifestyle. It is believed that this great martial art is the most effective striking discipline ever. Therefore if you are looking to learn all about self-defense, start searching for your trainer today! Thai boxing will teach you how to use your own body as a powerful self-defense weapon. All of which, we must say, leads to greater confidence and mental strength. Not only that boxing will teach you how to defend yourself but you will also learn how to control your strength. Therefore, you will be able to defend yourself, without getting hurt and only using the leat necessary strength to stay safe and defend yourself. With a regular training routine and your own personal trainer of Thai boxing in Dubai, you will be able to commit to your workout schedule. Therefore, you will much more easily reach all of your training and health goals. Another great thing about martial arts is that they teach you how to use, but also control your strength. Lack of discipline in boxing will result in bad coordination and pain, Therefore, people that start practicing boxing usually fall in love with it and start working on their discipline from day one. Boxing will also teach you adrenaline management. This means that you will be able to tire much less and slower and have a greater level of self-control and discipline in high-pressure situations. 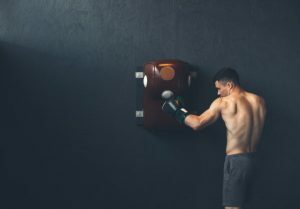 Boxing is fun and is a great sport for anyone who likes to practice martial arts and improve the usual workout routine by trying different techniques. As boxing has been around for ages, it has evolved and improved as a sport countless times. Therefore, you will find many different types of boxing classes Dubai for gentlemen and ladies. Are you a newcomer in Dubai? 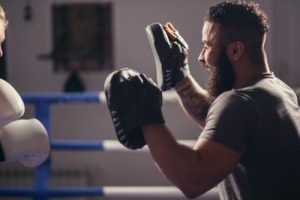 Signing up for a class of Thai boxing Dubai or hiring a kickboxing personal trainer Dubai will help you make new friends while developing new skills and having fun. As there are many different groups’ and individual classes available you will be able to choose the technique and schedule that suits you. Moving abroad can be fun and challenging and fun at the same time. With a new job, unknown surroundings and all the excitement and task that come with a relocation it can sometimes be difficult to stay fit and healthy after moving to a different country. However, there is no need to worry. We are here to help! In order to be able to include a regular workout routine into your busy daily schedule, you should search for reliable personal trainers in your area. With a kickboxing personal trainer in Dubai, you will be able to exercise at the time and place that suits you the best. Not only that hiring a personal coach will help you stay healthy, fit and relieve stress. It will also allow you to meet new people and get to know your new city. Whether you are looking to join Thai boxing Dubai classes or hire a personal trainer, you don’t have to break the bank. You can search for cheap personal trainers in Dubai, train with a colleague or join a class. Some people even prefer hiring a personal trainer for a shorter period of time and continuing with the workout routine later by themselves. This way they use their trainer as a reliable source of information on proper training and nutrition. Whether you decide to hire a trainer or exercise on your own, make sure you research in advance and find the best trainer and online sources of information to exercise safely and reach your boxing and fitness goals.